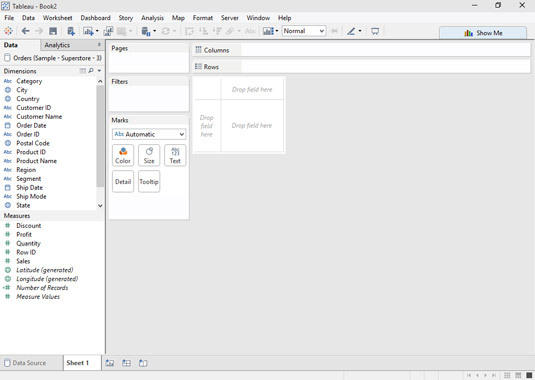 Every new Tableau workbook begins with a blank worksheet named Sheet 1. After you’ve connected to a data source, that worksheet is ready for you to begin creating a view of your data. 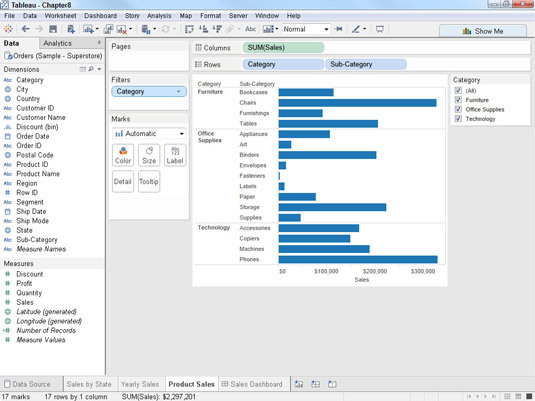 Tableau always creates a blank worksheet when you open a new workbook. A blank worksheet is like a fresh canvas for an artist — it’s ready to hold your next masterpiece. You can build anything from a simple bar chart to a scatter plot complete with trend lines and confidence bands. 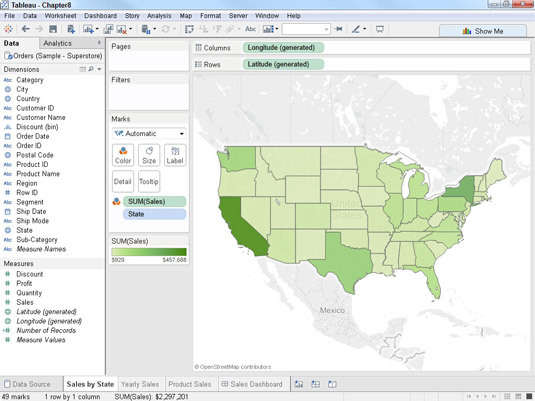 As flexible as Tableau worksheets are, each one can only show one view of a subject at a time. You can’t, for example, show a stacked bar chart and a symbol map on a single worksheet at the same time. If you want to see both on the same page, you need to create a dashboard and add the visualizations from your worksheets to the dashboard. You can only create visualizations on worksheets, not on dashboard or story pages. You can use — but not create — those visualizations on dashboards and stories. To get a better feel for how you can put multiple worksheets to use, let’s take a look at a quick example. Here, you see sales by state plotted on a geographic map. This worksheet shows sales by state. Here’s another worksheet that shows total sales for each year. A worksheet showing total sales by year. 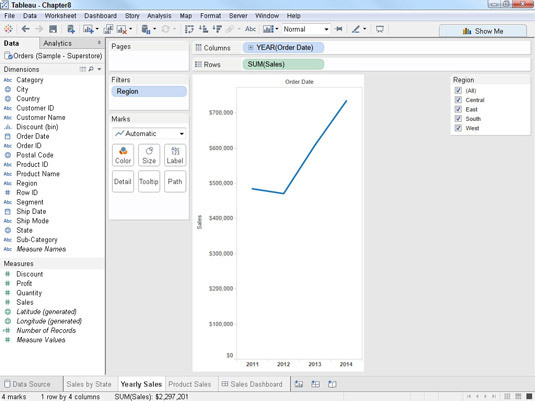 Finally, here is a horizontal bar chart with sales sub-divided by product category and sub-category. The final chart shows sales by category and sub-category. 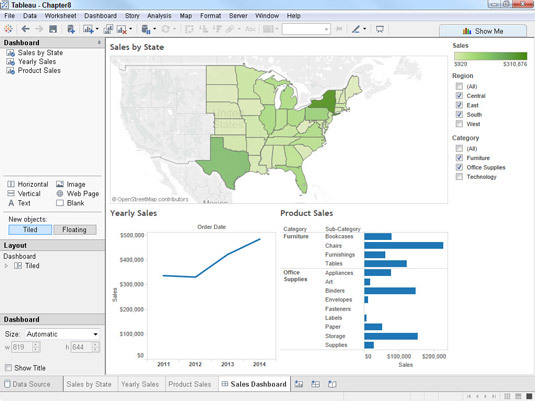 Now that these three visualizations exist, let’s add them to a Tableau dashboard so that it’s easier to share a more complete picture of sales with other people. Check out the completed dashboard, which clearly shows the value of having multiple related worksheets in the same dashboard. 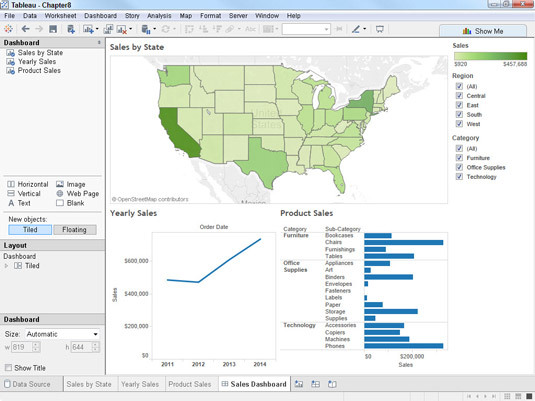 The dashboard uses all three visualizations to tell the story of sales. In this example, the dashboard also includes quick filters for region and category as well as legends to explain the content by specifying the meaning assigned to the colors. Look here to see what happens when both the Region and Category filters are selectively applied. Now, only the results that match the filter criteria are displayed. The results are now filtered. Although you could keep each view on its own worksheet and click between them, this example provides a clear picture about the usefulness of having all three visualizations available at the same time. Not only are you able to tell a more complete story, but the interactivity allows viewers to explore the data for themselves. It is important to account for the “scope” of your quick filters. Which sheets do you want the filter to affect? Any quick filters that you create and apply work in both directions between worksheets and dashboards. That is, if you select a specific region or category on the quick filter shown on a dashboard, it also applies to any worksheets that have the same filter. Likewise, if you select a specific region on the quick filter on a worksheet, the dashboard will also display the same selection.